The woodchuck is commonly known as a "groundhog", are often considered nuisance pests when their natural habits of eating crops and vegetation and constant digging deep burrows conflict with our homes business and place or worship. People mostly complain and call us when wood chucks are burrowing large ground holes next or near their homes. Burrows are also common underneath decks and porches. But the biggest problem we hear is when their vegetation and crops from gardens, farms and lawns get eaten and destroyed. Due to these few of many nuisance calls Dr. Pest Control NY is constantly hired to humanely trap and remove this nuisance wild animal. Dr. Pest Control NY has trained professionals and will remove nuisance woodchucks from your property. Give us a call now! 866-615-7378. Dr. Pest Control delivers Solutions! Woodchucks/Groundhogs are large rodents. Adults average between 8 and 13 Lbs. in weight, they hibernate from late October to March depending on their geographic location they give birth in early spring to 3-6 young. Woodchucks live about 6-7 years in the wild. They are herbivores and their diets consist of vegetation. Woodchucks/Groundhogs are great diggers. They are capable of excavating tunnels and burrows underground where they live, raise and protect their young. 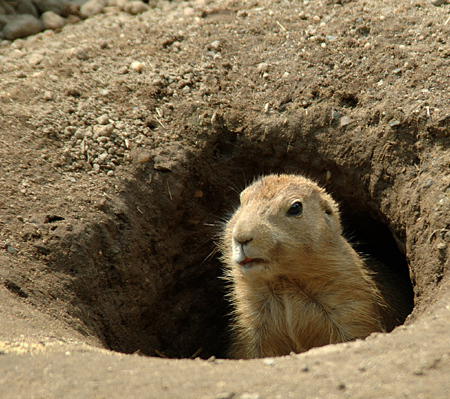 A woodchuck's burrow can have multiple entrances and can reach about 50 feet of tunneling. In this same burrow they hibernate all winter. They awake and begin their normal active lives during spring and shortly look for a mate. Woodchucks are mainly active during the day and return to their burrows after sundown. They are great swimmers and good climbers, however they mostly stay in the fields. When threatened, woodchuck's retreat towards their tunnels, they can make a variety of noises to discourage possible predators. Wood Chucks are considered Agricultural pests since they eat all crops and vegetation. However it is their burrowing habits, which often cause bigger problems. In barns, horses often break their legs by falling into woodchuck burrows. The burrowing can be a bigger problem when the digging is near a home, a deck or next to a structural foundation. The removal and loosening of the soil can undermine and weaken the foundation and what it supports. The most effective method to get rid of Woodchuck/Groundhogs is by humanely trapping and removing them from the property. Body and lethal body gripping traps can be effective as well , but again they are lethal. Repellents have been used in the attempt to repel woodchuck, such are moth balls, fox and coyote urine etc. but never proven to be effective. Dr. Pest control can help you get rid of all woodchuck and ground hog wild life causing damages in your property. Call now, 866-615-7378. We deliver solutions.